Established in 1902, Big Basin Redwoods State Park is California’s oldest State Park and is a gem of the park system. 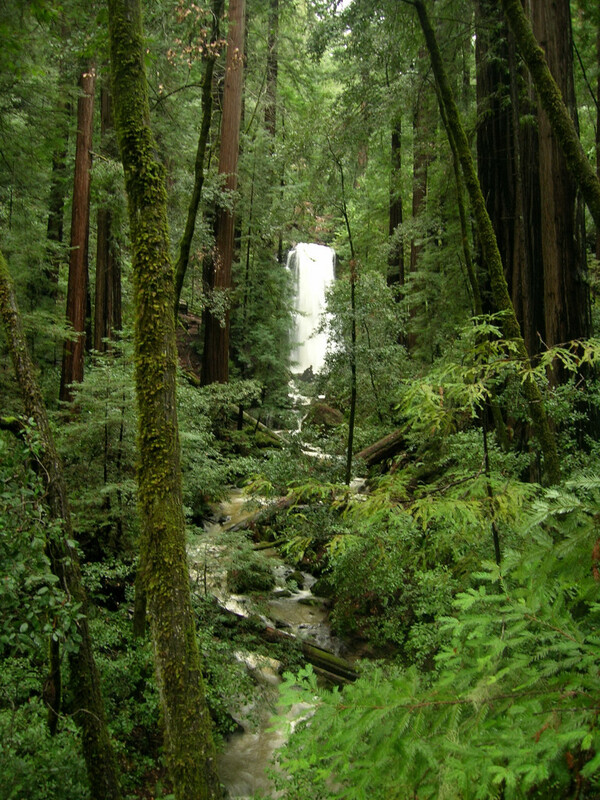 The park is located in the Santa Cruz Mountains and contains the largest continuous stand of old growth redwood forest (in square miles) south of Humboldt State Park 250 miles to the north. 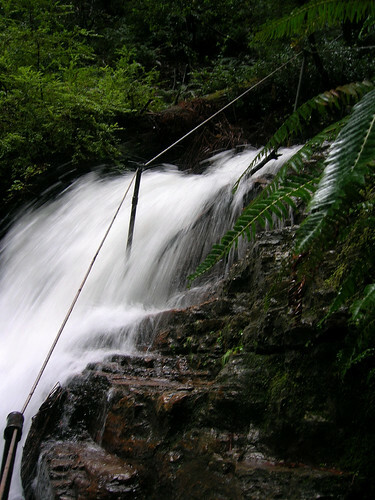 There is over 80 miles of trails to explore passing through a variety of habitats. 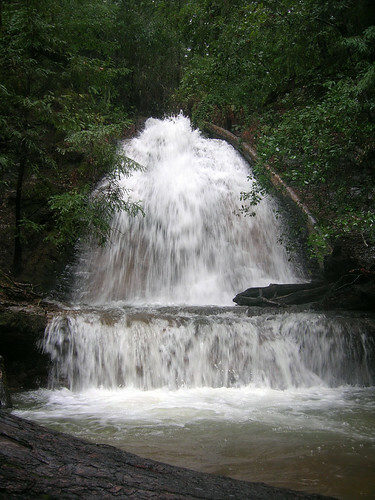 The most famous hike in the park is the Sunset-Skyline to the Sea Loop which passes through an area of impressive waterfalls, including Berry Creek Falls, Silver Falls, Golden Cascade, and numerous smaller waterfalls. These waterfalls are particularly inspiring in the winter after a heavy rain when they turn into swift torrents. The 10.5 mile loop (~17k) contains 2,245 feet of elevation gain and is virtually all under a lush canopy of old growth redwoods with a carpet of redwood sorrel and ferns. 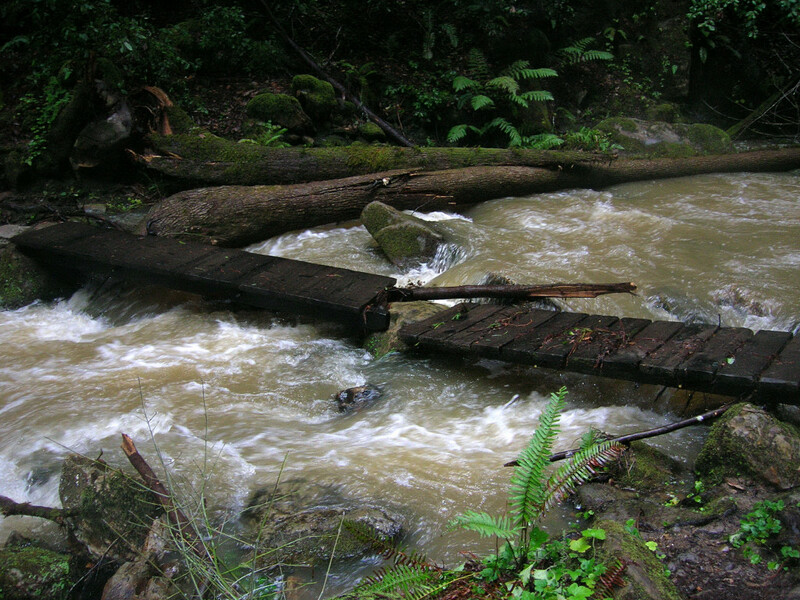 After a very dry start to the winter, the storms finally arrived in the last two weeks and culminated in a system that dumped over a foot of rain on Big Basin in a span of 60 hours. 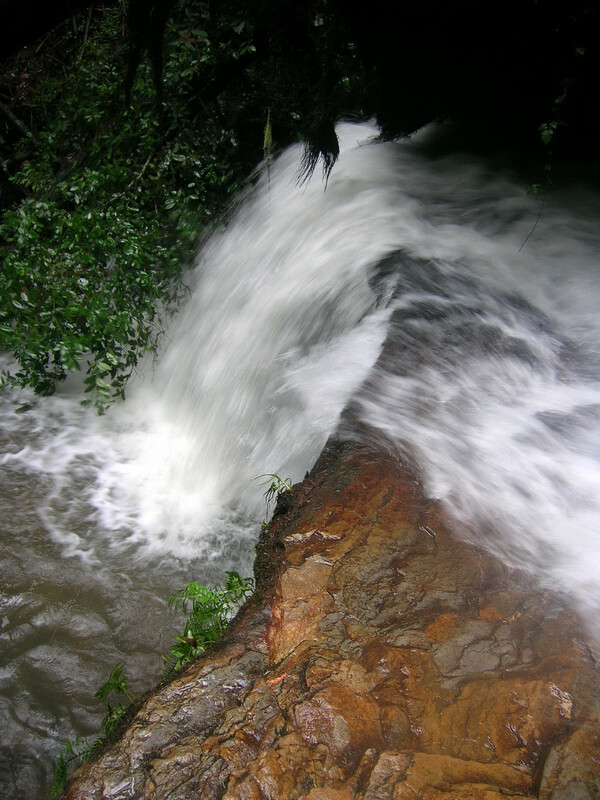 The heavy rains provided a great opportunity to visit the park and check out the waterfalls, which were flowing with more volume than at any time in the past three winter seasons. 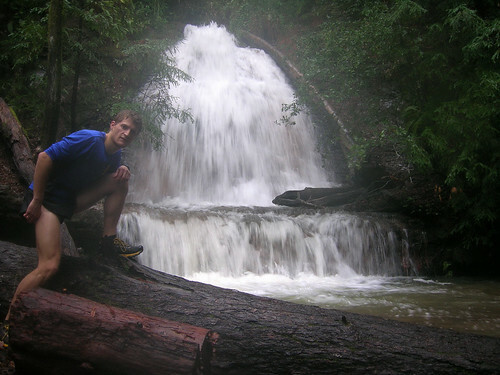 The trails were very muddy, I was running in a stream in many places, and there were several messy blowdowns to negotiate, but it was worth the price of admission to see these amazing waterfalls in full-flow. The loop starts at the Big Basin Headquarters and climbs a few hundred feet to a pass before making a gradual descent over 5k in the West Waddell Creek drainage with 1,000 feet of net elevation loss. Along the way, numerous delightful streams are passed and near the bottom of the descent West Waddell Creek gains momentum and volume as you run alongside it on a technical trail. 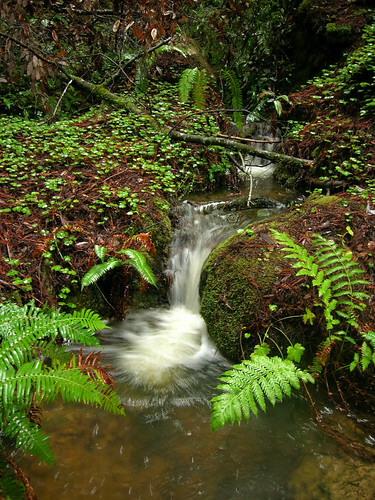 After crossing West Waddell Creek, a small hill is climbed and Berry Creek Falls suddenly comes into view through the lush redwood forest. 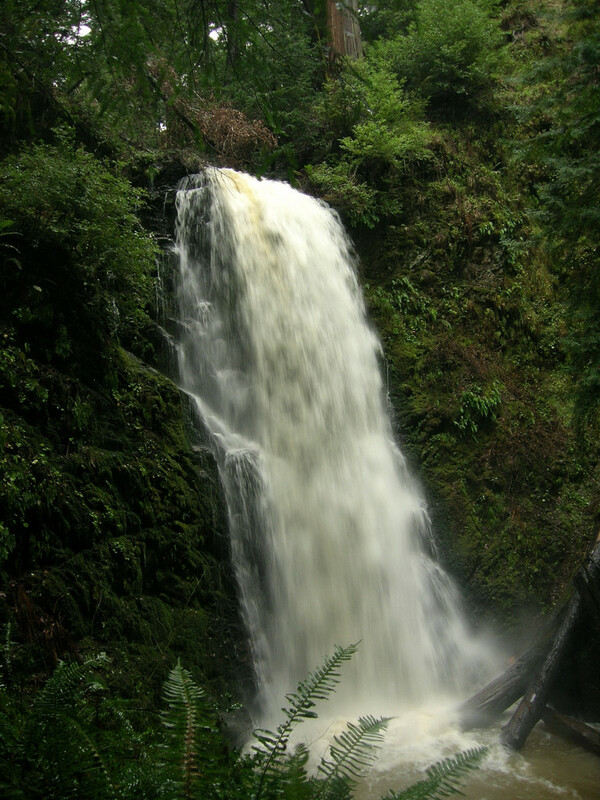 Here, the route leaves the Skyline to the Sea Trail and ascends the Berry Creek Falls Trail, which climbs to the top of Berry Creek Falls and then meanders through a narrow canyon before reaching Silver Falls and Golden Cascade. 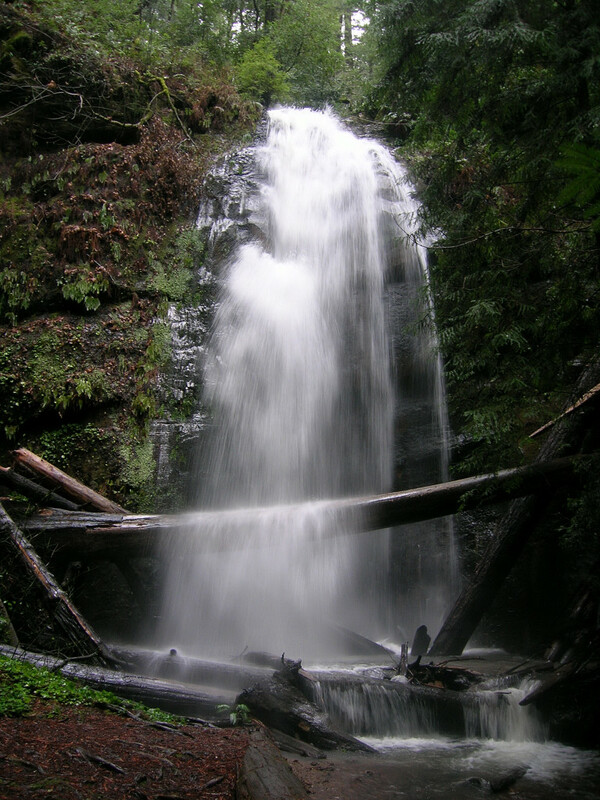 The ascent of Silver Falls is notable because the rock staircase is chiseled into the rock right next to the top of the waterfall. On this day, the staircase was submerged in water, but thankfully there was a handrail! The return segment of the loop is along the Sunset Trail which traverses through several drainages before climbing back to the pass and descending to the park headquarters. The Sunset-Skyline to the Sea Loop is the course for Pacific Coast Trail Runs’ annual Big Basin event, part of the series of PCTR runs sponsored by La Sportiva. 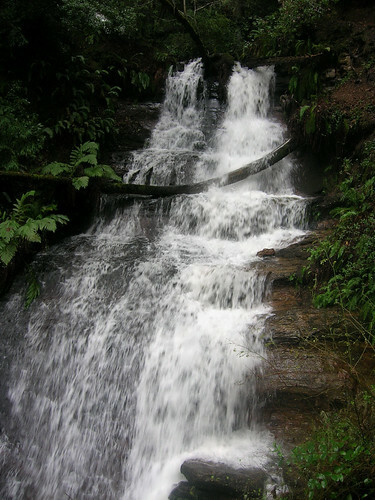 This entry was posted on February 18, 2009 at 11:32 pm and is filed under Trip Report. You can follow any responses to this entry through the RSS 2.0 feed. You can leave a response, or trackback from your own site. Looks like a gorgeous park. Nice photos! Those waterfalls remind me of the ones in Oregon along the Columbia River.